Spring Term Update – What’s been going on? We celebrated World Book Day in style as only our children and staff can again this year. The costumes were outstanding and celebrated everyone’s favourite stories, characters and authors. 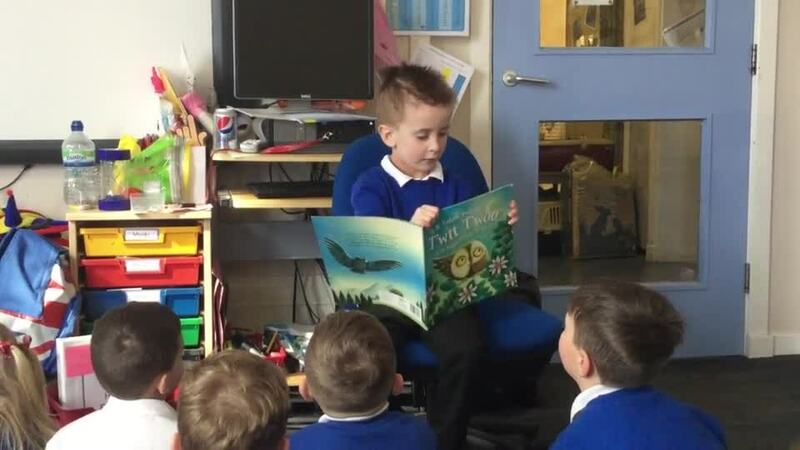 We held a special assembly and each class took part in fun reading and drama activities linked the children’s own books and our class readers in school. A fabulous day to recognise how important reading is and how much pleasure it can bring. Nursery have been sharing and enjoying books by the author Julia Donaldson. They have started work on rhyming and are regularly taking books home from our library to share at home. Phase 1 phonics has started with the children going on sound walks around school beginning their very important journey of hearing and deciphering environmental sounds. Reception are working hard during daily handwriting activities to improve finger strength for letter formation and writing. They are using story mapping skills to begin structuring their work and guided reading sessions are now taking place weekly in class. Our Year 1 children are being inspired to write through the ‘Supertato’ series of books. They have written their own stories using the characters they have met and written ‘How to’ guided for growing peas. The children continue to refine and improve finger strength through fine motor activities and there is a big focus on letter formation in handwriting. The majority of the class are working to be secure in phase 5 phonics in preparation for the up-coming phonics screening check – but more importantly preparing them to be confident, independent readers and writers. Year 2 have found the immersive world of Enid Blyton’s ‘The Enchanted Wood’ maintains its charm for children and adults alike. Parents have been enthused to see them revisiting an often cited favourite childhood book. The children have been inspired by this book to write letters to persuade a company not to cut down forests, their very own fairy tales and a newspaper article about the shock discovery of a tree that acts as a portal to different worlds! The class recently sat their first practise SATS test and this has helped them begin with familiarisation of the assessment process and has assisted Mr Wright in his planning, interventions and challenges. In year 3, following on from reading a literary classic in the autumn term, the storytelling skills of Michael Morpurgo are being enjoyed with The Butterfly Lion class text. Links have been made to both history and geography topics through literacy this term. The children have been using speaking and listening skills in debate work and using drama and reading to support story writing. Year 4 are desperately trying to train their dragons in literacy and have written instructions and their own stories using themes from the book. They have drawn and painted dragons and produced a beautiful display in their classroom. Year 5 are busy reading Journey to the River Sea, writing their own tales of being lost in the Amazon and campaign speeches ready for class debates about deforestation. We have been learning about our rights and have held a peaceful protest sharing our thoughts on how to care for the environment and our future. Our reader links perfectly to our geography work on South America and we have used it to inspire our carnival dance in P.E. To finish off the term we are having an Amazon art day where team work and communication is key to recreate a section of the River in our classroom. Year 6 are preparing for end of year assessments and are working exceptionally hard to showcase their talents in reading and writing. Their class text is The Jungle book which has inspired them to write reports, travel articles and narrative encounters. They have been debating and presenting arguments for and against Mowgli returning to civilisation, showing how well they can think and form opinions for themselves – secondary schools watch out! Literacy is at the heart of our curriculum at Pittington Primary School and we teach all aspects of the English curriculum in almost everything we do. We teach the children the importance of being able to communicate with one another through, writing, roleplay, speaking, listening and reading. The children learn in a literacy-rich environment and have lots and lots of fun in the process – which is exactly what learning should be! At the moment we are busy launching our new ‘reading team’ – a set of characters we use to help the children to understand different types of questions and what is required in answering them. Each member of staff has become a character of the team and will be in role for special assemblies and for whole school events like World Book Day. Writing is a life skill and we promote it in every single subject we teach. The children are taught the skills they need to write for different purposes. They learn the grammar, punctuation and spelling rules they need to be fluent and accurate writers. As a staff we work hard to give the children first-hand experiences and create a positive climate for writing. We encourage our children to be creative, imaginative and to take risks with their work. The writing they produce speaks for itself. Spooky story writing with carved pumpkins to add to the atmosphere. Budding news reporters using role play to support writing. At the moment in school we have a drama group working hard in their own time outside of lessons to produce a Christmas performance of The Grinch. Spaces were filled immediately in the group and as interest is so high throughout the school, we will be looking at giving opportunities to even more children in the new year. Watch this space to see pictures of the children in costume - currently being created by some of our talented staff in school….